The Ankaray, termed a “Light Metro” system, was the first phase of the modern rapid transit network of the city. The Ankaray was constructed by a consortium headed by Siemens during a period of four years (1992-1996). 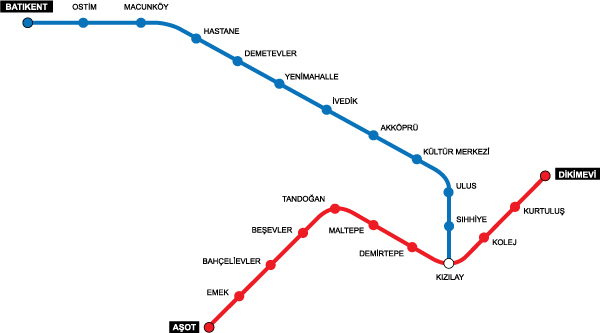 The line runs between AŞTİ (Ankara Şehirlerarası Terminal İşletmesi – Ankara Intercity Bus Terminal) and Dikimevi, over a distance of 8.7 km, of which 8 km are underground tunnels. The system runs 11 trains consisting of three vehicles each, totalling 77 metres and 180 seats, with maximum 600 passengers. The line has 11 stations. Ozgen Design Studio provided visual information solutions for identification, orientation/wayfinding and for informing users.